Series 704T is a top hung with a sill that complies with disabled access - gap less than or equal to 13mm, this complied with Australian Standard AS1428 access and mobility. Doors have been tested for compliance with the relevant Australian Standards. Achieved a high water resistance of 300Pa with 35mm high sill. The 55mm sill is rated at 450Pa water resistance based on tests carried out on a similar door/sill configuration. Aluminium sub-sills are standard under Series 704T doors. We have a variety of sub-sills to choose from. Sliding panels are supported at the head with heavy duty rollers for smooth operation. When recessed into floor sill is disability access compliance, no gap greater than 13mm. Combined with a FlowTHRU drain for the ultimate flush sill solution. AWS hardware options designed for use with Series 704T SlideMASTER™ Sliding Door (Top Hung). 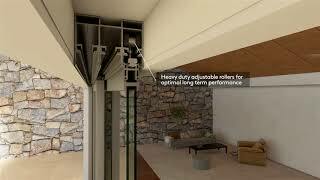 AWS complementary product options designed for use with Series 704T SlideMASTER™ Sliding Door (Top Hung). AWS systems designed to share similar aesthetic and performance qualities to Series 704T. AWS systems which offer a similiar function to Series 704T but differ in aesthetics and performance.